Detailing the physical features, habits, territorial reach and other identifying qualities of the Common Buckeye Butterfly. The Common Buckeye Butterfly has numerous bold eyespots on its forewing that resembles a 'buck's eye'. The Common Buckeye is a member of the diverse Brush-footed Butterfly family. 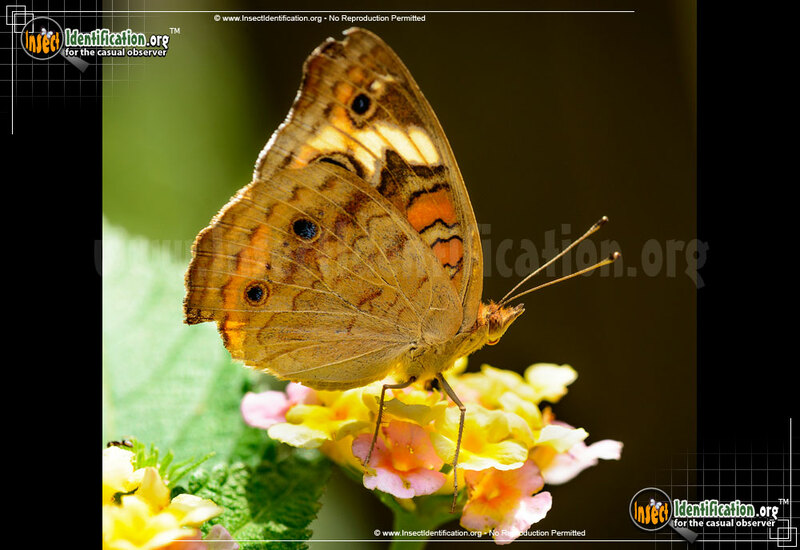 This means it is related to the Monarch, Viceroy, Malachite, and the Fritillary subfamily. 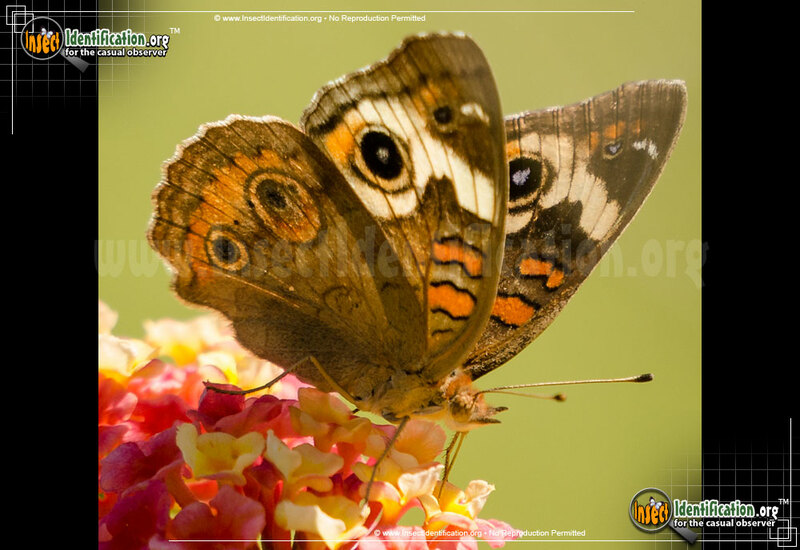 The front pair of legs of these butterflies are very short and almost so difficult to see that many people only count 4 legs at first glance. In addition to their diminutive length, the front pair of legs are also covered in short bristles, or hairs, like a hair brush. 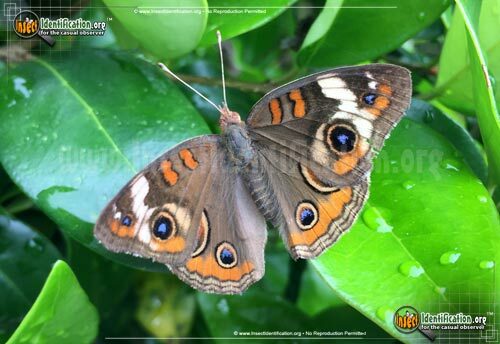 Common Buckeyes are mostly brown and have one small and one large black-and-blue eyespot on every wing. 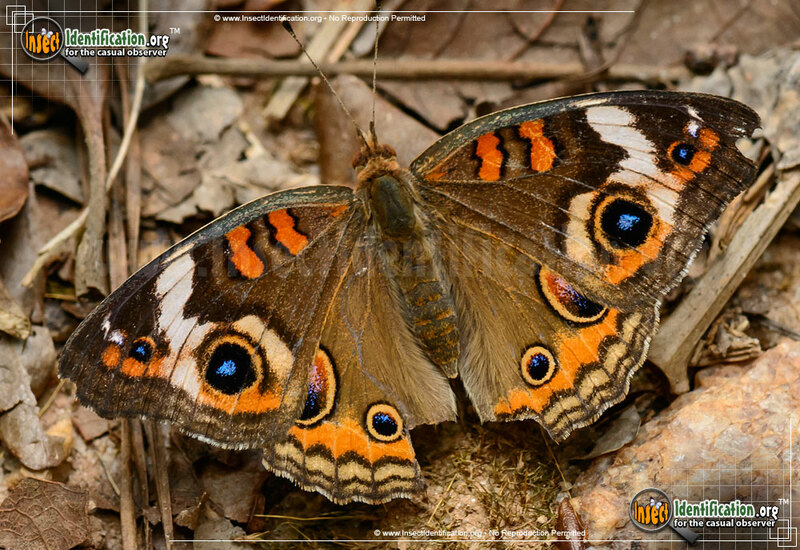 These eyespots are ringed in orange and black. 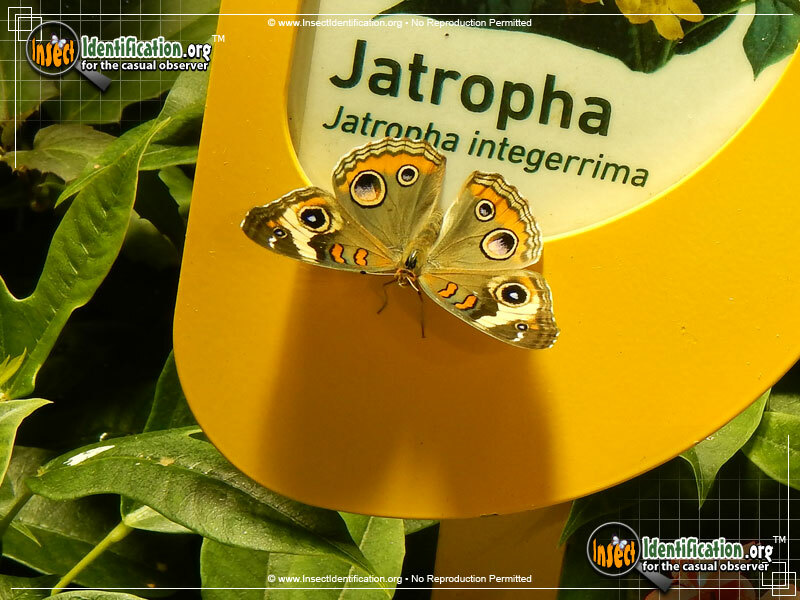 Two prominent orange bands on each forewing are near the head with a thick ivory band that encompasses the larger eyespot. Orange and light brown form a border at the bottom edges of the wings. The underside of the forewings are less ornate, retaining two medium-sized eyespots on a brown wing. Each antennae has a small knob at the tip. 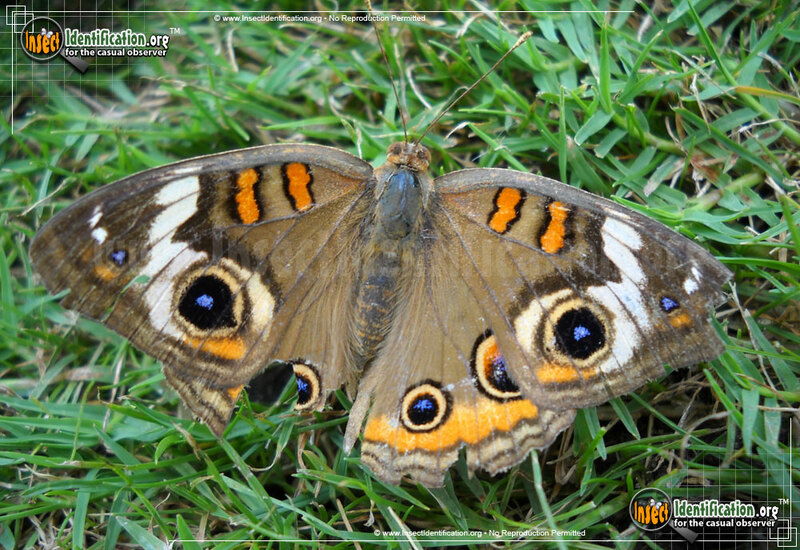 Though seen occasionally as far north as Canada and the northern U.S. states, the Common Buckeye does not breed there. They prefer warmer states and can breed up to 4 times a year in warmer climates. They usually reside in open land. 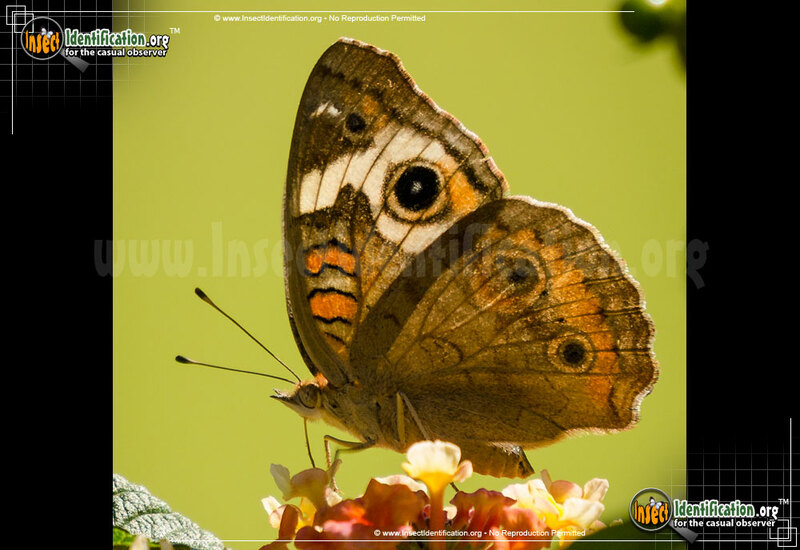 Males are very territorial and will fly out at anything that passes too closely. The caterpillar is a black color with white and orange lines and stripes. It also has black bristles sticking out on the dorsal (back) side at each pair of legs. These caterpillars love to feed on plants from the plantain, verbena, figwort, snapdragon, monkey flower, and stonecrop families.